While Iran has taken over political news, causing quite a stir, globally, a group of musicians visit Beurit, then Cairo and Assiut for the Spring Festival to showcase Iranian folk music with an electro-rap fusion. On Saturday, 12 May, El-Genaina Theatre hosted the Spring Festival finale concert, bringing Ajam, a group of Iranian youth, who grew up in United Kingdom, on stage. Basma El-Husseiny, the director of Al-Mawred Al-Thakafi, who organises the Spring Festival, introduced the band: "We started the festival with Turkey and ended with Iran." El-Husseiny anounced that some band members' visa was refused to Egypt. "No visas are given to Iranians, full stop," she said as the crowd broke into an anti-military rule cheer "Down, down with military rule." Three band members did not have British passports, like the rest of the band, who were able to come to Egypt for the performance. "The musical relationship between Egypt and Iran is older than any kind of political situation," El-Husseiny told the crowd. Ajam played a set of 13 songs from all over Iran. They introduced each of their songs to the audience through a leaflet distributed at the start of the show and verbally, each stemming from a different region of the Persian land having strong historical and cultural context. The group kept their audience engaged, moving to the beat with their high energy performance, especially with Amin Ajami, lead vocalist and oud player jumping up and down all over the stage, making jokes with the audience between sets. "I'm definitely losing my voice after that one," Ajami says on stage with a smile. 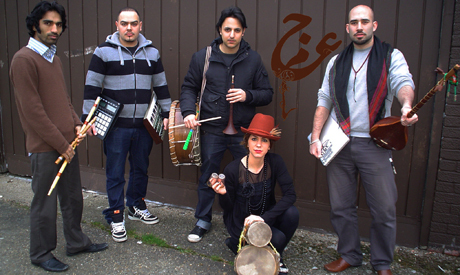 The band use traditional instruments such as the oud and sitar, and mixed it with fast percussion beats and electro-dub music. "We got our influences from the folk music, the rural music of the shepherds of the villages, the weddings, street music," Nariman Akrami, a member of Ajam who plays the electro beats told Ahram Online. Ajam visited several regions of Iran, meeting villagers who master the folk music, locally known as Malhameya, to find the roots of this dying art and make it more appealing to young audiences. The band kept the foundations but added urban sounds, such as hip-hop and dub. "If hip hop was formed in Iran, this is what it would sound like," Akrami said. "Hip hop is the music of the people, the people of America, it's not our music." Akrami explained that Iranian rap had been there for thousands of years, which sounds quite similar to Egyptian contemporary shaabi (popular) music. "Just not in the way you hear it on on MTV," he joked. Ajam do not wish to copy other cultures' music, but aimed for originality. As each type of music creates a culture around it, they hope their music will promote and showcase the rich, diverse culture of Iran, steering clear of politics. AJAM use their music to raise awareness and make a change. "The subjects we talk about stem from things we experienced," Akrami told Ahram Online. They played a song about diversity. "Some Iranians talk about people behind their backs," Amin said on stage explaining that we are all a little bit of everything and should not judge as he introduced the song Let Them Say What They Say. Another song focused on religion in general, specifically on the aspect of spirituality that is very sacred to Iranian culture. The group ended the show with a Zaar song. "Zaar music is used in healing," Amin explained to the audience. "So let us heal the world from racism," he said right before they ended the concert on a high note.